The Goonymarc was number eight in my line of modified Baby Bertha kit bashes. I started with the plans from Jim Z's for the Estes kit #654 with the thought of building the glider version of the Bomarc but ended up with the parachute version (kit #657). All templates and decals for this build were taken from the #657 Bomarc plans (http://www.spacemodeling.org/JimZ/est0657.htm). Again, as stated this was another kit bash so the first thing I did was purchase another Baby Bertha kit as the heart of this build. All components were used except the decals of course. Six additional components used in this build were a BT-60 coupler (that I made), an additional 2" section of BT-60 tube that I had left over from when I shortened the body tube for the Zoom Broom build, two hand made balsa NC's for the nacelle cones and two yellow engine spacer tubes from a couple of old Estes kits for the nacelle tubes themselves. Construction started on this build as most go with the assembly of the motor mount. This however was not glued in yet as I next added the 2" extension to the BT-60 tube first to make it 9 1/2" long. I added this section to the back end of the rocket so that it would not interfere with the NC and parachute deployment. This was the first Con: as it made it hard to put the motor mount in. The top CR needed to be sanded slightly more to make it fit. Once it was all in though I took a long balsa stick and added an extra bead of wood glue inside the tube around the top CR. I then ran a bead of white glue around bottom CR. Wing, stabilizer, and tail were then cut out and glued together and coated with printer paper. After paper was trimmed, wing and stabilizer were marked and notched for the toothpick probes. Two toothpicks were then cut in two and glued into place. After these were finished I attached the wing, stabilizer, and tail to the BT. Once these were glued on I went to work on the raceway, nacelle tube pylons, and nacelle tube NC's. Raceway was constructed from two 1/4"x1/16" balsa strips and notched on one end for the tail. After it was installed I grabbed some scrap balsa from my scrap box to make two small blocks from which the nacelle NC's were cut. These were then sectioned and glued back together for the front of the nacelle tubes and glued into place. I next cut and sanded to shape the pylons for the nacelle tubes. They were then glued onto the BT and then the nacelle tubes were glued to them. The other Con: was that it wasn't until after the maiden flight when I was checking the design of the original that I discovered that the nacelle tubes on mine were not glued on correctly. Mine are centered instead of being attached near the front of the tube. Being that this is a Goonybird though, I let it go. 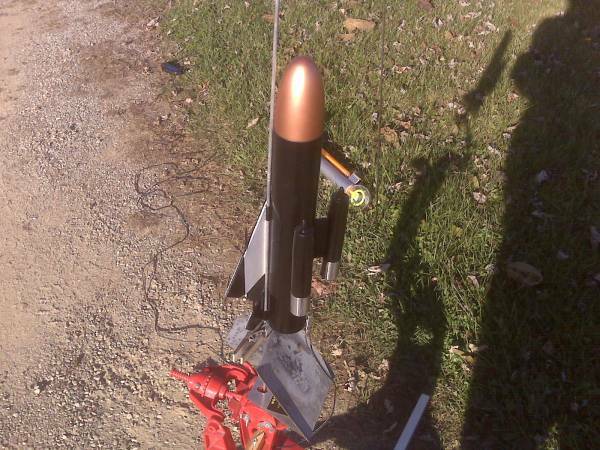 Finishing of this rocket was not completed until after maiden flight (see flight photo). So once maiden flight was out of the way, repairs and final painting were done. I then proceeded to finish the decals for this rocket. These were done in my standard fashion of printing them out on regular printer paper then clear coating the patterns and allowing them to dry. After that I flipped the paper over and sprayed the backside with white primmer. 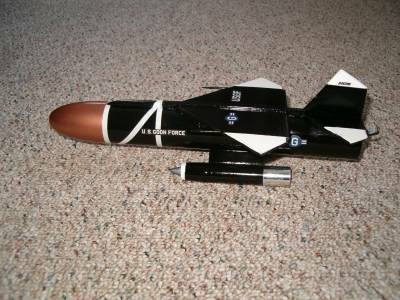 Once dry all decals were cut out and glued onto rocket with a glue stick. I also cut four 1/4" strips of white paper to use for the white stripes on the front of the body tube. The white stripes on nacelle tubes were hand painted as were the silver tips. After all decals were glued on, the entire rocket got two coats of Clear Gloss spray paint to seal everything. 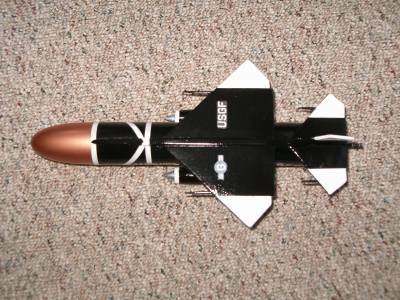 Maiden flight occurred on 11/11/09 at 15:06 on an ever popular Estes B6-4. Got in a hurry to fly this before the weather got to cold. Not all paint and trim work done yet. Rocket weather cocked quit a bit coming off the pad. Was almost horizontal by the time it cleared the tree tops. I had to run over to other side of house to recover so I didn't see parachute deployment, but it looks as if it got tangled with tooth pick probe on left wing as it was a tangled mess and the tooth pick was lose. Slight damage to right nacelle NC as well and a small nick on right wing tip from apparent ground impact . Will need slight repair before finishing paint and decals. Will need to add some additional nose weight as well. This was another fun build and one I still wished I had built as a glider. May still try and build the glider version if I can get the balance figured out.